Carl Crawford, Josh Beckett, and Adrian Gonzalez have underachieved and are on the verge of being traded to the Los Angeles Dodgers. 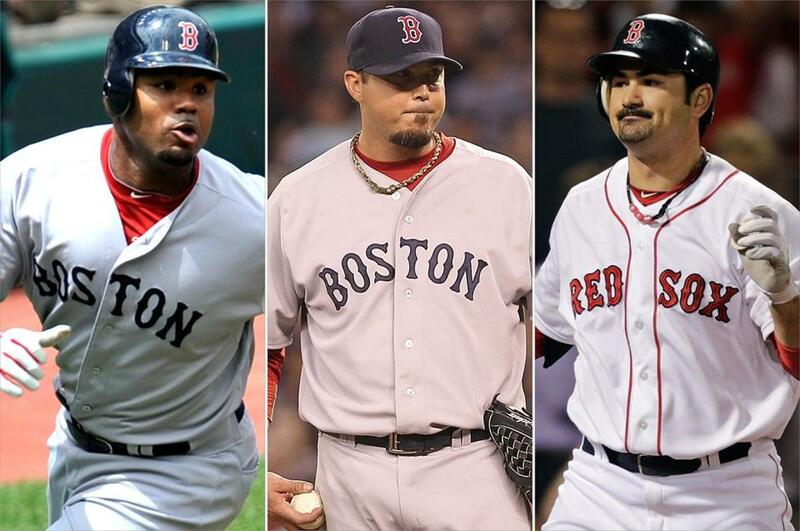 It would be the biggest Red Sox trade since Babe Ruth was dealt to the Yankees for cash in 1920. Hope this one works out better. On Friday night, the Red Sox were on the verge of dealing Josh Beckett, Adrian Gonzalez, Carl Crawford (plus journeyman Nick Punto), and their accompanying fat paychecks to the free-spending Dodgers for first baseman James Loney and a bunch of young guys you’ve never heard of. You want them to blow it up? This would be blowing it up. The prospective blockbuster would signify a white flag on this horrible season. More than that, it would mark the end of a failed era of big names, big salaries, big egos, and maddening underachievement. Will any of the prospects the Sox acquire emerge as blue-chip big leaguers? We don’t know. That’s not what this trade is about. This trade is about clearing the air of the stench created by the 2011 and 2012 Red Sox. It’s about saying goodbye to arrogance, unearned entitlement, and poor performance from top-priced talent. It’s about changing the rotten culture of the Sox clubhouse, a malaise that has turned even diehard fans against the once-beloved franchise. After 12 infuriating months of passivity, sloth, and denial, the Sox look like they’re finally admitting they have a problem. This is always an important first step. The deal would be a whopper . . . in terms of the people who are leaving Boston. Even though the Sox would get little immediate help in exchange for three of the biggest names in baseball, this trade is likely to be applauded by a Red Sox Nation that has grown weary of Beckett’s attitude and poor performance, Gonzalez’s abject lethargy, and the complete failure of Crawford. Maybe someday we’ll look back and say, “What were they thinking getting rid of all those good players for a bunch of no-names?’’ But right now it feels good, like throwing away everything that’s cluttering up your attic. Get ready for a bridge year. Maybe two. Maybe three. However, if the Sox make this deal, and if the Dodgers pick up all the salary, the Sox would be free to spend again. Beckett stands to make $15.75 million in each of the next two seasons. Gonzalez has $127 million remaining on his six-year deal. Crawford, who just had Tommy John surgery and has done virtually nothing in two years in Boston, was on the books for five more years at $20 million per season. If this trade is made, Theo Epstein will be wide-eyed in Chicago — watching John Henry, Tom Werner, Larry Lucchino, and Ben Cherington dissolve the uber-team Theo assembled in the winter of 2011-12. Beckett has been with the Red Sox since 2006 when the Sox acquired him along with Mike Lowell in exchange for shortstop phenom Hanley Ramirez. The stubborn Texan enjoyed one great season for Boston. He channeled Bob Gibson in October 2007 and delivered the Sox their second World Series championship in four seasons. But he was never right after the golden days of ’07. He became the poster boy of the chicken and beer fiasco of 2011. He failed the Sox in September 2011 and was no better in 2012. Fans came to hate him with the power of a thousand suns. He may pitch well in the National League West, but he will not be missed in Boston. He simply has to go. This trade is about clearing the air of the stench created by the 2011 and 2012 Red Sox. Gonzalez was hailed as the next great Sox slugger when he was acquired for a couple of elite prospects after the 2010 season. He had an MVP-caliber first half with Boston in 2011, but fizzled down the stretch, losing his home run power and complaining about too many Sunday night games. He’s still a solid .300 hitter who delivers with men in scoring position, but he’s simply not a winner. With the Padres in 2010 and the Red Sox in 2011, Gonzalez was part of two of the biggest folds in big league history. Now we have the Sox train wreck of 2012. It’s hard to put your finger on it, but watching Gonzalez up close for almost two full seasons, I’m beginning to think there’s a connection. Crawford hasn’t done anything to offend anyone around here. Nor has he done anything to impact winning. He’s been a Hub Hardball misfit from Day One. Playing for the Red Sox, he’s done none of the things we saw when he played against the Red Sox. He seems overwhelmed by his contract. He knows he can’t live up to the expectations that come with a $142 million deal, and he stopped being Carl Crawford. He isn’t even a good outfielder anymore. It’s a mystery. A surgery and a move to Los Angeles will be good for Crawford. It’s probably never going to happen for him here. In February 2011, looking around at a clubhouse bolstered by the celebrated acquisitions of Gonzalez and Crawford, Beckett spoke openly about being on a team that might win 100 games. For four months of 2011 the Red Sox were that team. After a 2-10 start they were 39 games over .500 from late April through August. Then they went 7-20 in September. And they’ve been an abomination this year. The Sox are a sickening 19 games under .500 since the beginning of last September. August 2012 has been as bad as September 2011. We’ve been waiting for methodical Cherington to do something. Now it looks like he’s doing it; he’s shaking up the Red Sox like no deal in the last nine decades. This might buy some time for manager Bobby Valentine. Lucchino hates to admit that hiring Bobby V was a mistake. Lowered expectations from this deal might enable the Sox to bring back their beleaguered skipper. Maybe this time, instead of firing the manager, the Red Sox are going to clean house and trade the players.